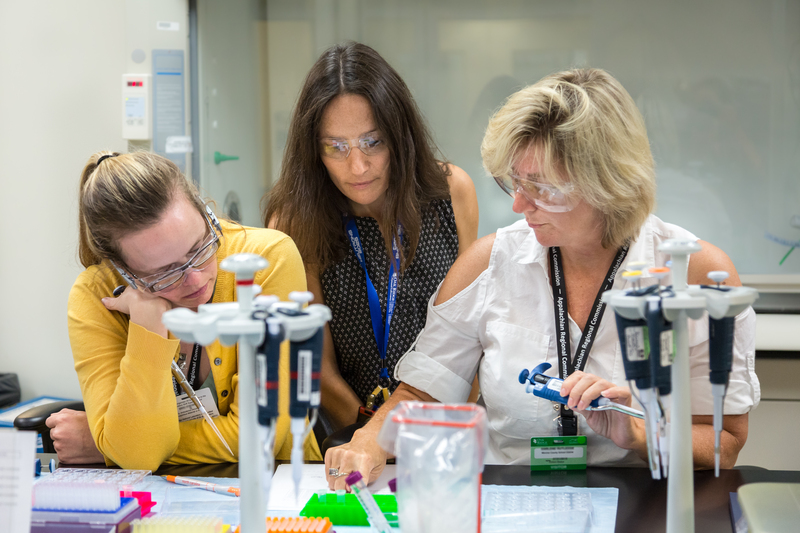 Summer break for a group of science educators and students means hands-on research in high-heat plasmas, supercomputer construction, biofuels and more, thanks to the annual Math-Science-Technology Institute held at Oak Ridge National Laboratory. The program, a partnership among ORNL, ORAU and the Appalachian Regional Commission (ARC), provides high school students and teachers with a unique, two-week research experience opportunity. The 52 participants, from 13 states around the Appalachian region, conduct research projects with the help of top scientists from ORNL. This year, projects range from measuring the force and energy imparted by a high-heat flux plasma to building a supercomputer or investigating biomass structures to improve biofuels, and much more. “I chose to build a project around protein crystallography, not only because this is what I do and enjoy, but because it is impactful and fun for the program participants to grow and handle crystals,” said Meilleur. “Participating in the MSTI allows me to interact with high school students and teachers from challenged areas. I feel that I’m accomplishing something really important by reaching out to less privileged students. Meilleur’s project is one that purposefully involves only teachers, but will contribute to the education of students in the long run. “The great thing about this project is that it’s something the teachers can take back to the classroom afterward and do with their students in an affordable way,” said Meilleur. The other projects all follow the same format. The teachers are able to make lesson plans involving the research conducted at the Institute, then take them back to their classes to use long after they leave ORNL. The ARC program is focused on improving economic benefits for the Appalachian region through encouraging high school students to continue their studies after graduation; encouraging them to pursue careers in science, technology, engineering, and mathematics (STEM) fields; and providing higher quality STEM education in high schools throughout the region. Participants are divided into 9 different teams—5 student teams and 4 teacher teams—each completing their own unique project over the course of the program. “We ask the students their research interests, having them rank the general science categories, and I do my best to provide them with a project that matches their overall research interests,” said Tyrell. The projects involve the use of real, cutting edge research in the STEM fields. In the portion of the project Meilleur oversees, the participants prepare protein and salt solutions, and mix them up in order to grow crystals. Then they observe the results using a microscope before transferring the best crystals onto an X-ray diffractometer. Later, the project participants run a molecular dynamics computer simulation of the crystallographic structure, which the UT/ORNL Center for Molecular Biophysics assisted in setting up. This step especially helps in providing research data for the teachers to take back home with them. At the end of the two weeks, participants present their projects to all those involved in the MSTI program.